A rough start and a bucket of pinecones. 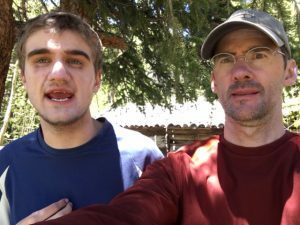 This week, my dad took me on my very first real backpacking trip. We started out after driving to the trailhead on Monday afternoon. My dad was getting the stuff ready in the packs and I decided that I needed to go gather pinecones in a big bucket that I brought from home. My dad didn’t know where I had gone. He was worried and angry that I had disappeared. 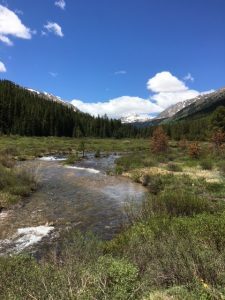 He went looking all over down by the river which was raging very hard from the winter snowmelt. He was gone for just a few minutes. My dad was calling my name and whistling and I knew that I should get back but I really wanted to fill the bucket with pinecones and take it with us. My dad came back to the truck and we met up again. My dad was really mad that I had left and reminded me that the first rule of backpacking was the buddy system so that we wouldn’t get separated. He also told me that I couldn’t take the bucket with me. It would be too hard to carry for our long trip and we needed to leave it behind. He was right, of course, but I still didn’t want to leave it. So we had a bit of a showdown before we even got started on the trail. My dad just sat in the truck until I was ready to leave the bucket behind but it took me a while to make that choice. Just then, it started to rain and so our trip was off to a rough start. I’m sure my dad was having second thoughts about bringing me on the trip. He said he didn’t know if he could keep me safe. But, I decided that I really wanted to go and that I needed to listen to my dad. 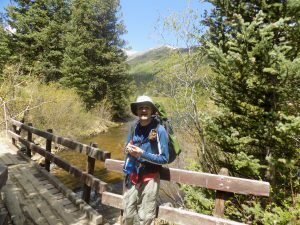 So, I put down the bucket and we started on the trail. Love you Dad for making me listen. Now we started walking and carrying our packs. They were really heavy. Could I do this? I wondered, at first, but I decided not to think about it and started just putting one step in front of the other. We made some pretty good progress. As it started to get dark, we found a spot where we could set up camp. It was a very beautiful and quiet spot near the river in the middle of some trees. My dad got right to work setting up camp and starting a fire. He gave me an assignment to gather wood but I didn’t really feel like it. So my dad did all of the work of setting up the tent, gathering wood, getting water and making dinner. My dad did this the whole trip. I felt bad about that but I just didn’t have the energy to help him. My dad just did it without complaining and I am really grateful for him. The first night dinner was a pizza that we cooked in tinfoil on the fire. It tasted good after a long hike that’s for sure. Then we just hung around the fire. It was very quiet and peaceful. I loved that. All the time at home, there is noise. It was nice to only hear the sounds of the river. I slept really well. 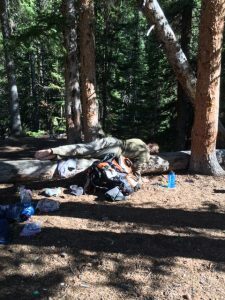 The next day and camp number two. A big day was ahead of us so we got up early. Dad was already awake and making breakfast when I got myself out of the tent. We had a big bowl of oatmeal. I will admit that I’m not a fan of oatmeal but I ate as much as I could. Dad wanted me to try new foods on this trip and although that is really hard for me to do, I did my best. We broke down camp and got everything back in the packs and set off for the second day. Starting to hike again was tough because we were sore from the night before but once we got going it was easier. The hike on day two was amazingly beautiful. 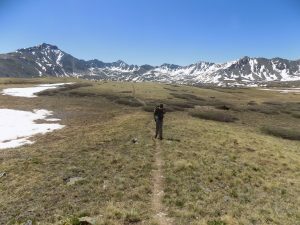 We got up high enough to have the trail open up into these beautiful meadows that were surrounded on all sides by huge snow-capped peaks. We stopped a few times for a snack and to just take it all in. At every turn, the scenery became more spectacular. 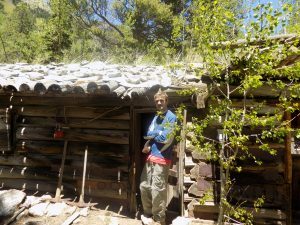 As we continued up the trail, we came upon an old miners cabin that was pretty cool. There was still a bunch of artifacts inside that he used to make a life for himself out in the wilderness. Sometimes, I wonder if life would be easier for me in a little cabin in the woods. I’d have to get used to oatmeal, I suppose but I can’t imagine that all the peace and quiet wouldn’t do me some good. It is all of the sounds of the city that can bother me the most. I guess that I have really sensitive hearing. Anyway, after a break at the miners cabin, we carried on our journey. We made it another mile or so and then stopped to set up camp. The second camp was also in a beautiful spot by the river. It was more open than our first camp and had bigger trees so it felt somewhat more grand. Dad got right to work again setting up camp. I still wasn’t any help because I was exhausted from the hike. My dad was superman though and just did it all. He didn’t complain about it this time either. Next trip, I’m going to help, I promise. We started a fire and made some dinner. Scalloped potatoes and hot dogs. It was amazing even without ketchup. I usually dip everything that I eat in tons of ketchup but we didn’t bring any so I had to deal without but I survived. Maybe, I don’t need the same foods all the time like I thought. I’m going to try to branch out when I get home. This trip is really good for me, I think. We had another super night’s sleep. At least, I did. Big thanks to dad for filling my belly and tiring me out on the hike that day. Love you Dad. 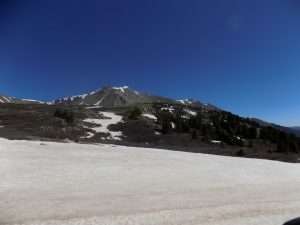 Day 3 and Mount Belford. We got up early again and had another bowl of oatmeal. I ate more of it this time so I was proud of myself for that. 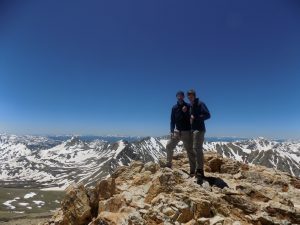 Today, we had on the agenda to climb a 14er. We emptied our packs of everything but the bare essentials and headed off. It felt great to have a lighter load, that’s for sure. We hiked a lot faster and it was way more pleasant. The trail was super amazing and we wound our way through meadows and streams until we came to the turn where we started ascending the mountain. At first, we were in a thick pine forest with patches of snow that we could mostly avoid by changing routes a little bit. 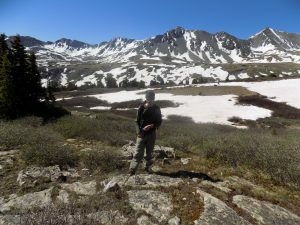 After a while, we came out of the trees and looked around and all we could see were amazing views and high alpine tundra. We sat and ate some jerky and cheese and just looked around. I don’t think I’ve ever been in a more beautiful area. The snack hit the spot, too. Beef jerky never tasted so good. After a few minutes, we started up again. Soon, we were surrounded by snow patches that covered the trail so the only way to go was through it. That’s a lot like life, isn’t it? Sometimes you just have to get your feet wet. Anyway, we plowed our way through the snow and found the trail on the other side. I am really glad that we are fit enough to do stuff like this because it was really challenging but awesome at the same time. It’s cool that my dad likes to push himself too. That’s a great lesson for me to always stay in good shape so that I can do it when I’m his age. Love you Dad. Anyway, we kept pushing our way to the top of the mountain. As the air got thinner, it was definitely harder to keep moving for very long. We had to stop and rest way more often. But now we could see the top so it was motivating. My dad would move ahead and I would catch up to him. Like a weinerdog, he was the head and I was the tail. We weinered up the side of the rocky mountain until we reached the top. At the top, there was a couple of hikers that came from another direction. They were really nice and took our picture. The views from the top were incredible. You could see forever. It was so cool to see all of the Colorado mountains at once. They were all still capped with snow and it was just so beautiful. What an experience and I’m so thankful that I pushed myself so hard to see it. I’ll never forget this day. We had lunch up on top of rice cakes with peanut butter and honey. It also tasted great. 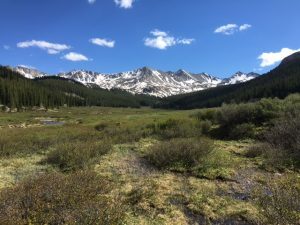 What is it about food in the mountains? After a while, we headed back down the same way we came. It was sure a lot easier going down the mountain than it was coming up. And we moved much faster so that was nice. We made it back to camp in way less time and I collapsed on a log. It was the most comfortable log ever. It felt good to be off of my feet. My dad rested for a little bit but then got dinner ready. Macaroni and cheese. It wasn’t my favorite but I got it down. That night, we stayed up late enough to see the brightness of the stars. Everything is so much nicer away from civilization. Then we crashed into bed. I slept like a baby. The next morning we were up early again because today we had to hike all the way out and had to take all of our stuff. 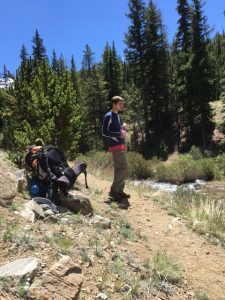 We broke down camp, ate our oatmeal and put the heavy packs back on our shoulders and started hiking. It was not very fun today. It seemed like we hiked forever. I was pretty tired the whole hike and was moving pretty slow. My body was really beat from the big hike yesterday and I didn’t feel like moving. So, I had a lot of OCD getting down the trail. That took twice as long and was very annoying but I could not seem to help myself. My dad just waited for me to catch up though and didn’t say much about it although I know he was tired too. He always stopped and bent over to rest his shoulders while I caught up to him. Finally, we made it to the truck. It felt so good to sit down. My dad asked if I still wanted to go fill the bucket with pinecones. No thanks! I’m sure glad he didn’t let me carry that bucket all the way up the mountain. That would have been miserable. I’m glad I finally listened to him. Father knows best. Overall, the last 4 days were a great experience. I accomplished something really hard and physically demanding. In the process, I learned some important lessons. First, listen to your parents. They always try to make things safer and easier for you. Second, I can do hard things even though I have autism. It won’t stop me from climbing all sorts of mountains. Third, I love nature. It is peaceful and beautiful and I’m less anxious out there. Fourth, popular trails are usually shorter. We went the long way but what a reward. Such is life. Fifth, I love my dad for being there for me but still making me push myself to my limit. He is a great example of that and I am looking forward to many more trips in the future. And finally, I learned that the view is spectacular from the top of the peak but the journey is pretty awesome too. 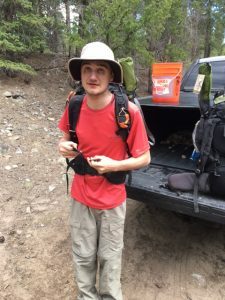 Awesome hiker, jerky lover and nature writer. See you on the trail. Congratulations! A nice day hike up in denver is to go up to Devil’s Head. You drive through Sedalia up to the rampart range road, then follow that road left down to the trailhead for Devil’s head. I used to camp my boy scouts near there often. 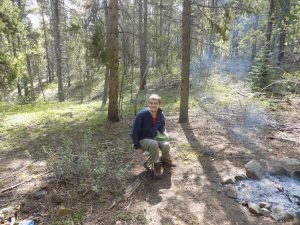 The hike follows a nice trail up a little over a mile to a Smokey The Bear fire spotting station at the top. In the autumn there are a lot of leaves, and it is quite beautiful. Nice tip. We’ll check it out! 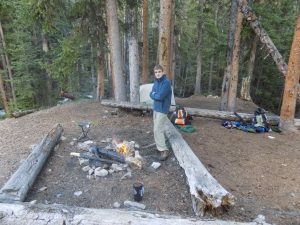 Awesome trip report Aaron. That’s a long hike. We did Belford a couple years ago and loved it. But, we weren’t adding it to the end of 2 previous days of backpacking. Pretty place up there. 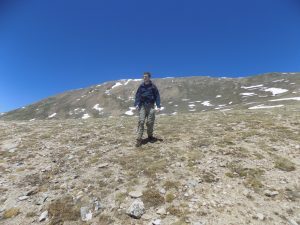 I’m taking Cassidy backpacking this weekend and going to try to climb Uncompahgre (a 14er in the San Juans) and this report got me excited to go. 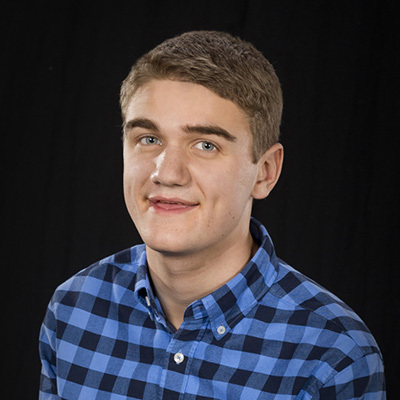 Aaron, this is a great report. You express some deep thoughts that I love thinking about as well. Isn’t it great to experience new things. One of the things I like best is trying new foods and I’m proud of you for branching out and eating what is available, and I’m proud of your dad for giving you these experiences. We love being in the mountains for the summer even though we’re not doing it at 14,000 feet. We love that it is not as hot at our camp as it is down in the city. Thanks, Grandpa. It was really fun and I loved being outside in the mountains. It will be great to see you in southern Utah in July. I am excited to leearn more about our family history. Love Aaron. Wow! I loved reading your post!! You write so well and describe what you see and how you feel really good! You are a great writer and I felt like I was on the hike with you. Your Dad is an awesome Dad for taking you on such a neat hike up the mountains. Keep up the good writing. We all love to hear from you.